The flag description.The blue stripe symbolizes the Mekong River. The red stripes represent the land along the river. The white circle signifies a full moon. Blue stands for wealth, and red symbolizes the blood of heroes who have fought for freedom. Laos is a pretty small country. It is about the size of Minnesota or the size of Romania. There are lots of mountains in the north and northeastern part of Laos. The Annam Highlands lie along the border of Vietnam. These highlands are basically smaller mountains or can be called a plateau. West of these mountains are rivers and lowlands which are very good spots for farming. Most of the rivers in Laos will drain into the Mekong which runs on the western side of the country. This river creates a natural border with Thailand. Now we get to the cities. Most of the important cities lie along the Mekongs banks which made the river and important transportation route until the 90's. Mostly all the goods and things are transported by roads now. In Laos they have lots of tropical rain forests. The most animals that live in there are elephants, tigers, and monkeys which have the most population for animals. About two-thirds of the population is Buddhist. Sepak takraw, the national game, is played by trying to keep a rattan (a bamboo-like plant) ball in the air without using the hands. Hundreds of millions of cluster bombs were dropped on Laos during the Vietnam War. Khone Phapheng Falls are the largest falls in Southeast Asia. The Plain of Jars dates back to the Iron Age and is a megalithic (large prehistoric stone) archaeological landscape made up of thousands of stone jars. Each jar is large enough to hold a person, and the largest ones weigh more than six tons! They are thought to be burial sites. Laos is home to the world's longest poisonous snake, the king cobra. Legend states that a seven-headed dragon lurks underneath an old Buddhist monument, the That Dam, in Vientiane and protects the city. When they sit on a mat on the floor to eat, the Lao cross or tuck their legs with their feet behind them to avoid offending anyone by pointing their feet at them. Women traditionally recover from childbirth by spending one month lying in a bed under which hot coals are placed. The warm temperature is considered necessary to restore her health. The baby lies on a separate bed. 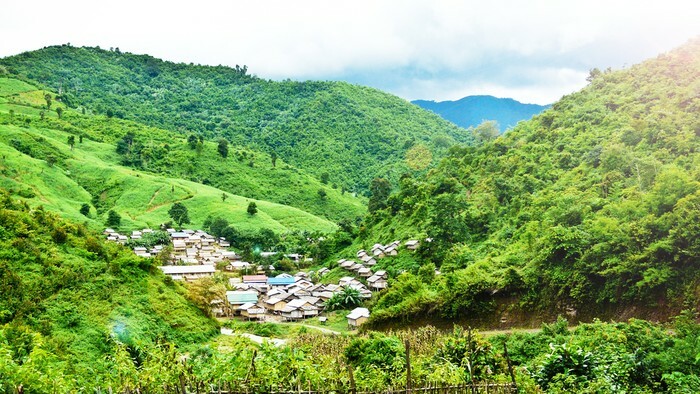 Laotian homes are usually shared by three generations of a family. A groom typically gives a gift to his bride’s parents to thank them for raising her properly. There are two sports that are played a lot. The first one is football(soccer) and the other you probably have never heard of before is Sepak Takraw. It is like soccer but has a volleyball net. The first one that I will be talking about is the most popular sport played in Laos. Soccer. They have a team which was established in 1951. They still haven't received any International soccer competitions yet. Even though they haven't gotten a international competition they still have good players like Messi and Ronaldo. For some people the Messi of Laos would be Visay Phaphouvanin. He is a very good player. In Laos most men play sports not the females. Some females play but most don't. Laos has never competed in the winter Olympics yet. They have competed in the Summer Olympics though. Now we move on to the national sport of Laos. Sepak Takraw. Like i said before it has a volleyball net but its basically like soccer. You cant use your hands. All you can use is your head,chest,feet,and knees. This sport is not in the Olympics and probably wont be.On each team there are 2-3 members. They play on a sandy area or they play indoor. This is a very popular sport in Southeast Asia. "Aisa." Britannica School. Web. 10 May 2016. Central Intelligence Agency. Central Intelligence Agency. Web. 10 May 2016. "Flag." WorldAtlas. Web. 10 May 2016. "Laos." CultureGrams Online Edition. ProQuest, 2016. Web. 5 May 2016. "Sepak Takraw." SportsKeeda. Web. 12 May 2016. "Highlands." Treasures of Indochina. Web. 13 May 2016. 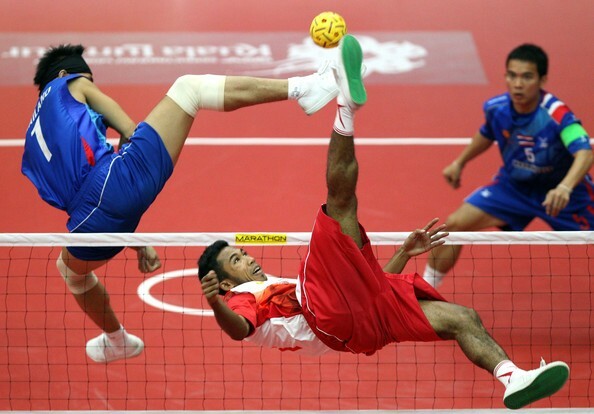 "Sepak Takraw." Sepak Takraw Official Website. Web. 16 May 2016.